Production | Crews | Characters | Sourcing | Props & HUDs | Building Sets | Shoots | Join in! Locations are preexisting places in a virtual world from which to conduct a shoot. This contrasts with a set, which is something custom built for one or more scenes. In general locations don't change much. They might or might not be owned by either a crew's group or even a member of a group, but in either case there will be reasons why the terrain and what's built in can't or won't be quickly changed. For example, the location may have a specific purpose (not just look good), people might have their homes there, or the location may be only part of a larger parcel with specific conditions. Within the Second Life/Opensimulator grids, there are three types of locations you can use: Second Life; The Hypergrid; and Stand-alone Grid. There are different issues for each of these types. In the following three sections, we'll use the example of scouting for a location that looks like a university. Second Life is the original grid that uses the "Second Life style" of world. As such it has a rich tapestry of sims from which locations can be sourced. But also, because of that, there's a variety of issues that can affect a choice of location. Generally places that are fully open to the public seldom need permission for your Avatar or Alt to be there (e.g. Governor Linden's Mansion). But this can also be a matter of scale. One Avatar might not make much of a difference, but a dozen or more, all with with attachments and maybe scripts, might. This can add to lag, and may disrupt the main purpose of that location. When in doubt, ask the owner first! Private/commercial locations must have prior permission to use doing a shoot there. You "might" get away with doing a shoot in someone's home if they're not there, but it's still an invasion of privacy. It's better to ask the owner first if it's OK to shoot in their home, and accept their decision (even if it's NO), than just go ahead anyway. You might not get the location you want, but you also won't be reported to the Lindens either. With commercial venues (like clubs) you also need to ask permission first. Imagine say, a dozen avatars appearing in a night club when it's open but not actually dancing or tipping, and all conversing only within their own group. That might be perceived as a form of griefing to those unaware of what's happening, and they'd be right! 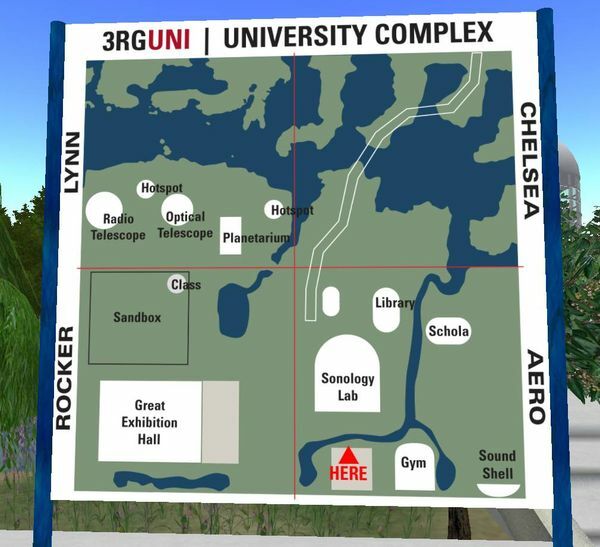 Looking for a university location, we find Cleveland Plus III, in Second Life. This is the in-world venue for Case Western Reserve University and is part of a multi-sim educational environment. The region's privately owned by the case builders group and is rated General. You can't drop or build objects in the region, nor can you push people, but scripts do work, and it allows public access. In addition to the large building facade (there are no rooms other than the foyer), there's also a pyramid building with a large lecture theatre and also a security room with mocked-up monitors! There's also another building in the sim that has meeting spaces and medical simulation roleplay spaces. Also scattered around the sim are open boxes with mockups of office and and interview spaces. On the surface this seems an ideal location. Shooting here with half a dozen avatars or fewer probably won't disrupt any of the activities that normally happen here. However, any larger number of avatars/alts, or shooting in the lecture theatre, simulation, or mockup areas might do so. And what explanation what you offer of one of the avatars of the owning group turned up when you were shooting in the security room? Better to ask under these circumstances. OpenSimulator is the "opensource version" of Second Life, and the Hypergrid is the collection of OpenSimulator grids that are connected to each other. What this connection means is that avatars in one grid can teleport (visit) another. So, although each grid is individually smaller than Second Life, combined together as the Hypergrid, they create a tapestry of regions and builds that is diverse and potentially rich in detail. This means that not only cam you find unique and interesting locations, but you can have a crew that consists of avatars from different grids, who teleport to the grid the location's in! Everything about locations that applies to Second Life, also applies to the Hypergrid. In addition there are other concerns that affect the use of a location. Hypergrid worlds, having a much smaller population of users and avatars, tend to have a higher sense of community. Asking for permission for a large shoot is good manners in a community, and also an opportunity to involve members of that community in the shoot as well. Not only that, but it's also a good excuse for avatars in orther grids to come visit. It helps to have someone who has an avatar in that world to ask permission as well. Otherwise not giving warning, and having a bunch of "out of grid" avatars turn up, do the shoot, and then disappear, doesn't do much for the grid or the owners of the sim you're shooting in. However if you or members of your crew come forward and make the shoot a grid or community event, you add interest and variety to that grid. You may not be able to use NPCs in someone else's sim, even if you can build or drop items there. NPCs require at least a "high" level of security to work properly. See at OpenSimulator for details. Looking for a university location, we find Chelsea, and its adjacent sims of Lynn, Rocker and Aero. This is the 3RGUNI, and part of the Mainland in 3rd Rock Grid. Within these resions we find a variety of buildings and features, including ornamental ponds, domed buildings including the scriptorium, radio and optical telescopes, astronomy displays, the great exhibition hall, a large lecture theatre, and others. So there are a variety of places that we can use for a shoot. The regions are owned by the 3RG Elders group, and while public access is allowed, only members of that group can add objects or run scripts. The sandbox is the exception to both of these restrictions. So, while these areas could be used for a shoot, with no scripting allowed it may be difficult to use things like HUDs, whereas gestures shouldn't be affected. That may not be an issue, unless you need a scipt to generate particles (perhaps for rain?). Someone with a camera HUD could still run it, but only in Rocker and only in in the sandbox. Not all grids running OpenSimulator are connected to the Hypergrid, though they might still be accessible via the internet, depending on how they are configured. Either way the grid is running on the owner's server which is usually on their hardware. So, the number and size of sims is only dependent on what the owner (or members of the grid) creates and the storage available. ...then region ONE will be loaded, but region Two won't. To re-enable Two, edit the file and remove the leading semicolons. Because everything's owned by one person or a group, you can set the safety level to anything you want. That means that NPCs can be fully enabled in a stand-alone grid. You can create any number of NPCs to suit your needs, provided you've created a character for your avatar first, to copy as an NPC. One drawback to using stand-alone grids is that content must come from somewhere. In Second Life and the Hypergrid you can usually go out and buy something that might be close to what you need. On a stand-alone grid you can't buy anything you (or the group) hasn't already added or uploaded. The flip side to this issue is the use of OARs and IARs. An OAR is a backup of one or more regions. You can use the server console to save a region as an OAR, and load a saved OAR to a region. An IAR is an inventory backup and likewise, you can use the server console to save part or all of an avatar's inventory, and load a saved IAR to an avatar's inventory as well. Free OARs and IARs are available at websites slike Outworldz and Zadaroo, as well as elsewhere. Both can be used on the Hypergrid (and some places sell OARs) but you need to check the grid's documentation for how to do that. While free content is fine, just remember that if everyone else uses the same content, then whatever you create with that content will most likely look the same. Original creations will give any comics you make a more distinctive look. The most important use for both OARs and IARs is in backing up your stand-alone grid. You could just back up the grid by copying the folder (and subfolders), but backing up using OARs and IARs gives you extra options, such as copying a region, or having different "snapshots" of your regions and inventories, allowing you to "rewind" to an earlier version. To avoid confusion you should clearly name and date each OAR and IAR saved. For example an OAR of the ONE region saved on 4th Novemeber might have a filename of ONE(16-11-04).OAR, or ONE(11-04-16).OAR or maybe ONE(04-11-16).OAR.It really doesn't matter so long as you're consistent, and can tell one backup from the other. In our search for a university location, we come across The Universal Campus OAR (also availablehere). This was originally created to provide a "downloadable infrastructure for organizing and deploying collaborative meetings, such as classes, research group meetings, and conferences in a virtual 3D world." A noble idea, but our interest is in using it as a shooting location. After loading the OAR into your grid (see instruction_manual_v1.2 PDF/ODT on the website) we can examine the Universal Campus. It contains a variety of buildings including an observatory, a lighthouse, radar dishes and a heliport. A possible drawback to using this sim is that it's script heavy. Most of those scripts are related to videocasting and meetings, but even so that means that there can be lag, even before you deploy any avatars or NPCs. However, you can edit any settings for the region, and edit individual objects, so that may not be a big issue in the long term. One drawback is that this OAR is widely known so it will be immediately obvious to those familiar with the Hypergrid which region this is. Another possibility is to "redress" a region created by importing an OAR. Suppose we decide to go with the Universal Campus above, but in a later scene it's been devastated by an attack. We could simply load the OAR to another sim and then edit the objects in that sim to reflect the changes we need. This isn't going to affect the original OAR, which we could still import (perhaps for a flashback scene) if we need it. Good practice would be to save the modified OAR just in case (maybe with a name like Universal Campus(Modded).OAR). It's good form to credit any location used in a major shoot, especially if you have asked for and got permission to shoot in a (semi-)private/commercial sim. If you credit a location, you should acknowledge by whose permission you used it, and give a SLURL/Grid location so that others can find that location as well. When asking for permission, it can also be good to mention crediting the use of it as well.